SAVE!! 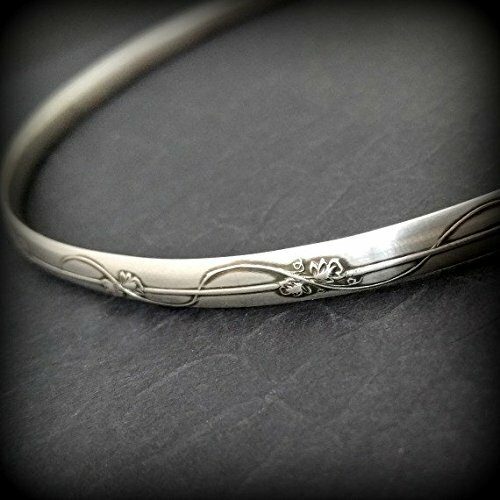 $288 ANY SIZE THIS ART NOUVEAU DESIGN COST CONSIDERABLY LESS THAN MY ORIGINAL DESIGN DUE TO REDUCTION OF SILVER, AND THERE IS NO NEED FOR A SNAP RING FOR THIS DESIGN An incredibly beautiful submissive collar is inspired by the art of Alphonse Mucha, with a timeless Art Nouveau floral and vine pattern. This substantial, solid sterling silver collar is nice and thick, measuring 6.27mm wide x 2.84mm thick. The edges are sanded soft, with beveled curves inside, making it comfortable to wear 24/7. Chain is added to the back of the collar to create a softer, more flexible fit. DAY WEAR and LOCKING A hand-crafted day clasps allows the pieces to be worn as a beautiful, traditional collar. The day clasp can be removed and the jewelry locked with small padlocks, transforming it from a traditional design into unique and stunning submissive jewelry. ENDLESS LOOKS Create an entire jewelry wardrobe by adding collar enhancers, as shown in the last photo. (Collar enhancers are not included in this listing) THIS LISTING INCLUDES ● is for one Art Nouveau Collar with Chain, made to order in your size ● one day clasp ● one small padlock with two keys (silver-tone) NOTE: Locks and day clasps may vary according to availability. If you have any questions about this product by My Secret Heart Jewelry, contact us by completing and submitting the form below. If you are looking for a specif part number, please include it with your message.